Hunting decoys are an important instrument when luring animals to a particular area. Useful in many different circumstances, they help attract prey to specific places, making your job easier and your hunt more successful. They are especially important when hunting in close proximity to others or on public land, and are an amazing tool that relies on patience and strategy rather than endurance or a chase. What is a Duck Decoy and What Are They Used For? A duck decoy is a fake bird used to draw ducks to the area you are hunting in. Ducks typically flock to middle parts of water, so drawing them there is a smart and efficient way to come away with more. Using a decoy allows you to rely less on stamina or chasing, and simply allows you to set up and wait for the ducks to come to you. A good duck decoy is realistic, can be seen from the air, is durable, and most importantly, is the right species of duck. What Makes These Decoys Stand Out? With numerous options to choose from, picking the right decoy can be daunting. Here are the three ways the decoys on our list come out as some of the top products on the market. The best decoys around are extremely lifelike. For some, relying on an accurate painting is enough, while others take into account things like posture, variability, and movement. All quality options are beautifully shaped and painted and have line features to allow hunters to move the birds when necessary. 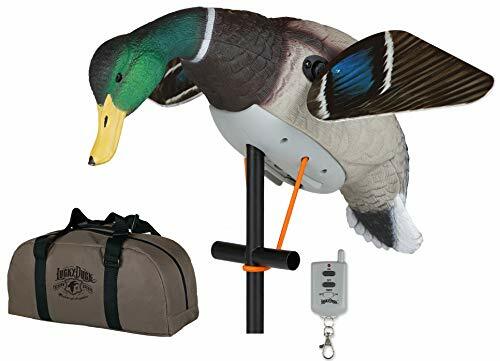 Some, however, take this to the next level, by weighting the decoys in different ways, or even adding remote control options to keep your duck decoys moving in a natural manner no matter what. No matter how realistic a decoy is, if it is poorly made, it won’t do the job. A good duck decoy is not only made from reliable materials, but should feature things like heavy-duty paint that is sure to stand the test of time, and water/weatherproof technology, especially if it is battery operated. Making sure to pick a decoy set that matches your wants and needs is very important. A good fit will mean that you and the decoy have a similar lifestyle in mind. Some are more technology-based, and can be remote controlled or battery operated, which aids with realism, but can be challenging to use in extreme weather situations or during long trips, unless extra batteries are provided. For many, the classic wooden design is easy to use and straightforward, while others may want something a little more high-tech to get the job done. With millions of options to choose from, finding the right decoy to invest in can be daunting. Here are the top options to pick from. AvianX Top Flight Wood Duck Floater Decoys are an amazing and realistic choice sure to attract ducks to your area. They are painted with incredible detail and are not only accurate, but a gorgeous representation. These wooden carved masterpieces were engineered to capture the posture and personality of ducks resting on backwaters. Crafted with rubber molding material and non-chip paint, these decoys are sure to last in any weather conditions and have a long lifespan. Featuring an innovative weight-forward swim keel design, the line can be snapped through the swim clip to create natural movement in currents or in light breezes. Sure to fool even the smartest of birds, they are slightly oversized for visibility from the air and measure 12.5 inches breast to tail. They come in a pack of six to mimic a small flock with four males and two females. These are some of the best customer-rated duck decoys, as they are durable, dependable, and realistic. Perfect for attracting birds to any waters, they are sure to increase your hunting yield for a long time as they are engineered to endure the harsh demands of exposure. Overall, these duck decoys are a great investment for anyone looking for quality wood ducks to attract a flock. They are engineered to mimic all aspects of live ducks including their markings, posture, and movement, and are created with the harshest elements in mind. Dakota Decoy X-Treme Flocked Drake Head Mallard decoys are a gorgeous hand-painted option and are the runner-up to the title of the best overall decoy. They are extremely realistic and varied, as each drake goes through a 24-step painting process and each hen goes through 16 steps. Not only are they each individual in regards to paint, but there are six types of heads in the 12 pack that can be attached to different bodies and can be rotated up to 360 degrees. 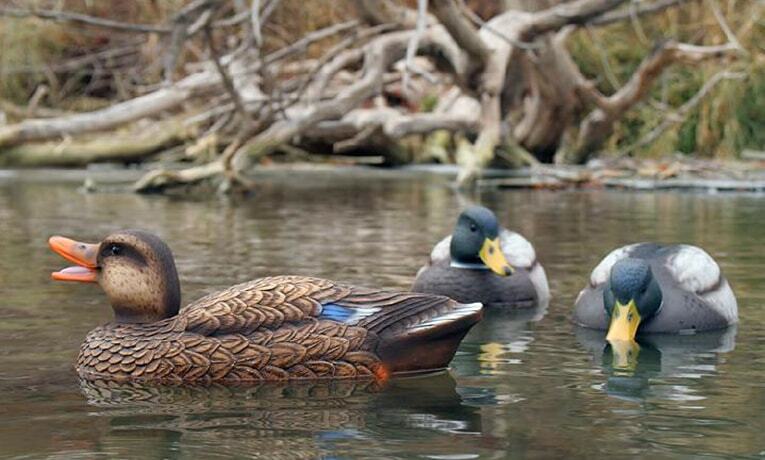 These are some of the most visually realistic decoys ever created. They are composed of a 60/40 blend of high and low-density polyethylene for maximum durability. Proven to be extremely tough in this brand’s other options, it ensures the longevity of your decoys. The ducks are also coated with paint that is proven to last, giving you years of use and consistent good looks no matter the weather or overall hunting conditions. They feature a weighted keel and have a cleat on the front of the keel to lengthen and shorten lines depending on the depth of the water. With seven drakes and five hens per package, there is significant variation that adds to the realism of the flock. Dakota Decoy X-Treme Mallard decoys offer durable and realistic options of duck decoys. They are rated as runner-up to the best overall and feature a weighted keel and front cleat for ease of use for hunters. They can be semi-customized with adjustable heads of various positions, but buyer beware, they can be difficult to attach in some cases. Avery Greenhead offers the best pro-grade duck decoys that won’t break the bank. 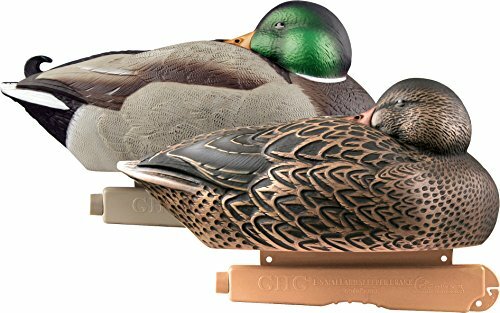 These ducks are some of the best-rated decoys by customers, as they are strong and long-lasting without being overly expensive. They offer no compromises other than price. They are crafted with an incredibly realistic painted exterior and carving to imitate the real nature of ducks both visibly and tangibly. From any distance, these decoys are sure to fool the eyes of friends and waterfowl. Made with high durability, pro-grade materials, these ducks are sure to last a long time in various conditions including weather, water, and general exposure. No matter how tough the hunting is, these decoys are tougher. They will provide reliable and consistent performance for many years, and allow you to focus on more important things than the condition of your decoys. They also feature thumb loops for easy pickup and storage and are user-friendly. Perfect for new hunters or anyone looking for a simple design. They are easily moved and stored, plus there is no need to worry about unwrapping or wrapping decopy lines. 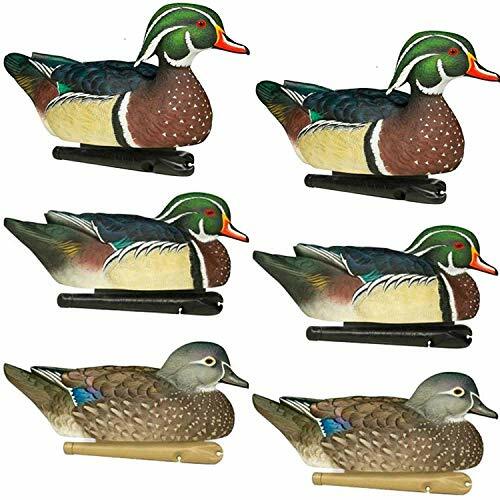 These decoy ducks are easy to use, exquisitely painted, and durable, all without the price tag you might expect. Avery Greenhead Gear Pro-Grade Duck Decoys are the perfect choice for anyone new to hunting waterfowl, or new to using decoys in general. They provide amazingly lifelike and durable duck replicas without breaking the bank. Durable and easy to use and store, these decoys are an amazing choice that only compromises on price. For those looking for a more dynamic decoy, Lucky Duck provides a remote control decoy that is sure to fool waterfowl from any distance. 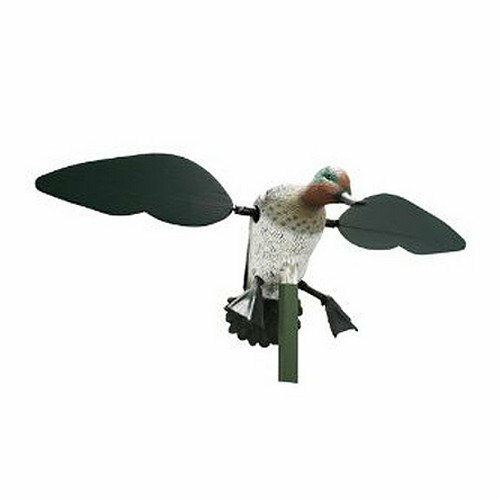 This decoy features a totally waterproof shell to protect its powerful lithium-ion battery. With a remote control, it can be moved from far enough away to not cause any suspicion. The package includes a carrying bag for simple and effective transportation as well as a seven-inch stake. This kit takes realism to the next level, as it is not only beautifully textured and painted but is structured for maximum accuracy regarding the posture and flight pattern of the duck it intends to imitate. It features external charging options, as well as an external switch to turn it on and off, and is the first fully waterproof model on the market, ensuring the longevity of its internal technology. The Waterproof HDi is buoyant due to the foam filling and has durable injection-molded magnetic wings. This model offers maximum realism in every aspect as well as astounding technology that helps it take the title of best remote control option. 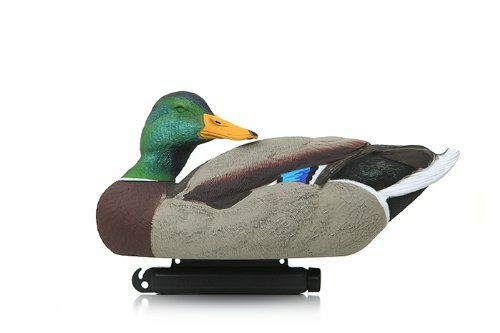 Lucky Duck provides an amazing remote control decoy that is sure to attract ducks to your area. It is realistic on many levels including visually, texturally, and via posture and movement. This model is totally waterproof and features a long-lasting battery, allowing you to create the most realistic and alluring experience for waterfowl. This model uses groundbreaking technology to give you maximum control without compromising things like durability or realism. This unit is sure to last a long time in any weather conditions without harming the internal battery, and is a great option for anyone looking to complicate the old school models for something a little more unique. The MOJO Outdoors Green Wing Teal Motion Duck Decoy offers a stellar green wing drake to lure waterfowl. With wings that function at twice the speed of typical spinning decoys on the market, this allows for quick operation that exceeds all other movements. Fitted with a three-piece support pole, it is sturdy in all weather conditions. It features the famous mojo direct drive system that can run for up to 16 hours on four AA batteries, making it perfect for long term use or hunting trips. It is exquisitely rated via customers, surely due to its realistic paint and texture, and protection of its inner technology. It is durable and highly lifelike, sure to attract ducks to your area with its realistic posture and high-speed movement. It is not remote compatible, but will do all the work, leaving you to wait for the birds to flock to you! It can function both on constant spin, or delay mode, allowing one more variable and making this unit even more realistic. The magnetic wings are attached firmly, ensuring they stay on while in the field, no matter how fast their speed or weather conditions, but have been reported tricky to remove for storage. This option is an amazing model for anyone looking for a battery operated and extremely real duck decoy. It has extremely fast wing speeds and is durable and realistic. It features a long battery lifespan and can be used continuously for 16 hours. It is perfect for traveling or use over trips, and is sure to attract ducks to any waters. There are many options for duck decoys on the market, including more basic and reliable technology as well as battery operated or remote controlled ducks. Realism via painting is unparalleled in this market, and some even are weighted or positioned to mimic the movements of ducks in the water. There is a good choice for every hunter, depending on the perspective use regarding weather, water, and trip length. When using duck decoys, people often still have questions. Here are a few of the most commonly asked. How Long Do Decoys Last? The answer to this question depends on the use and care of your decoy. When cared for properly, a quality decoy can last many years, although wear and tear are inevitable in the field. Regular cleaning, proper storage, and of course battery alternation in the more mechanical models will help your decoys last. Also, choosing one made with the most durable materials for your circumstance will aid in its longevity. A keel helps the decoy to ride smoothly and realistically in waters. Some are weighted for use in more rough waters, and others take into account where the weight sits for the most accurate movement of the bird. This is generally also where the line is attached if your model is more old school. What Are Other Uses For Decoys? Other than attracting ducks to your waters, a duck decoy has many other uses. The classic models can be a type of decor or collector's item when not in traditional use. Different types of bird decoys can be used to either attract or repel types of fowl depending on their natural relationships. They can also function as a type of scarecrow for the water on your property, causing their typical prey to scatter. There are some simple, yet very effective, ways to carry all of those duck decoys you'll need when hunting. Where you are hunting and type and size of your decoys will help determine the best method to use to transport them. What most duck hunters do is use some type of "case" which is carried. By "case," we're not talking about some heavy duty piece of luggage. On the market are many different types of mesh carrying bags -- different styles -- different sizes -- different manufacturers. These mesh bags have elastic tie-down straps which can be tightened to the right torque for carrying, depending on how many decoys you've got. Most of these mesh bags have two backpack type straps which means a hunter can put them on his/her back, and keep hands free for carrying other equipment, like a shotgun. And, depending on the size of the decoys and the bag, you can fit anywhere from six to maybe 20 decoys in a bag. The nice thing about decoy bags is that you can separate specific decoys for specific species -- mallards, wood ducks, bluebills -- whatever. So it's easy to organize things. You can also determine which bag will hold solid decoys, roll ups, magnums, or regular size. And, don't kid yourself -- all of this "organization" makes things a lot easier --before and after the hunt. Beforehand, you're anxious, you're in a hurry to get set up and hunt -- you don't want to play around. Having specific decoys and/or sizes in distinct and separated bags will help you get the decoys set up far more quickly and easily. No searching. No muttering to yourself, and no glares from others in your party. And then when you're done hunting, you're tired, you're cold, you're hungry -- and you want to get out of there as soon as possible. So you pick up your decoys and again organize them so you're all set for the next hunt, without a lot of sorting and all of that wasted-time-and-effort stuff. The mesh bags allow the water to drain; and just make sure, when you retrieve your decoys, that you at least clean off of any sludge or algae and other plant residue before putting them in the bag. The decoy mesh bags are not real expensive -- indeed, there are manufacturers and retailers who will often provide a "free" mesh bag when you purchase a decoy -- but they may not be exactly what you need. Just remember: "Free is good," but you'll still want to have enough bags to insure that you're well organized and that the decoys will "fit" properly. Now here's a real good money saving tip from guide Phil Schweik, for those of us who prefer to save EVERY dime we can! Phil's super-talented wife, Rhonda (one of the greatest hunters and anglers we've ever known) simply takes a burlap bag, affixes some straps, and sews it to proper dimensions and accessibility. Phil says they work beautifully, and are both strong and light. Cost? A trip to a local grocer or farmers market for some FREE potato burlap bags, and a few shekels for strapping materials. Happy hunting and decoy "schlepping." One of the key tools for hunting ducks is proper decoy placement. Proper blind placement is necessary. Proper DECOY placement is imperative! The very first thing that an experienced duck hunter considers is wind direction. Like an airplane, ducks land or take off into the wind. You will want to set up your decoys in a pattern that is conducive to forcing the ducks to land into the wind towards where you are in your blind; and that it is set up so that they're coming directly towards you into shooting range. This type of set-up, when executed properly, will provide the very best shot possibility you can have. There are several different tried and tested "patterns" that duck hunters use when setting out decoys. There's a J-Hook pattern, a V pattern, several different types of flock patterns, and a pocket pattern. The hoped-for result when using any decoy pattern is to insure that the ducks, when landing, will do so in the open pockets or slots between your decoys. And, typically, the ducks are gong to land like on a runway on an airfield. You want to set up the decoys far enough away so that ducks come over them and land in the slots between them. That also means you want to make sure that when the ducks are landing they're within optimum shooting range from your blind. All decoys are set up to insure that the ducks will land where you want them to -- near enough to your blind for a perfect shot, if possible. One of guide Phil Schweik's favorite decoys (he says it works unfailingly) is called a Mojo Duck (no one is specifically endorsing any brand here -- there are a number of similar decoys to the Mojo Duck and it is cited as just one example, as it is well known). Unlike decoys that float in the water, the Mojo Duck is elevated on a stake, and is battery operated. It's wings spin around and around, and look like a duck landing, or like a duck fluttering its wings as they often do on the surface of water. Elevated decoys like the Mojo Duck are very lifelike and really do increase the percentage of a successful hunt. They are very visually attractive to ducks. And while floating decoys may blend in to the water because of lighting conditions, Mojo Duck type decoys stand out, because there's movement, and this is also good because it takes the ducks' focus off of your blind and you, and directs it to the decoy. And yes, Mojo Duck decoys can be somewhat expensive. What some hunting buddies or clubs do is pool resources and "group buy." That's good for everyone and no one is hurt by a big expense. Now, if this all sounds complex, don't be frightened away by it. Duck hunting is a wonderful, fun sport. And don't worry about seeing all of those "fancy Dans" with their custom-made shotguns and their expensive boots and clothing, talking about their next country club get-together. You can do just as well -- even better -- just by using good, basic equipment, and "listening to your elders" -- in this case experienced duck hunters. Go out. Learn. Miss a few, and go from there. Sooner than later, YOU'LL be the one that will be the "elder" others are listening to. According to guide Phil Schweik, duck hunting is not usually a sport for the uninitiated hunter. Yes, someone can go out and puddle jump ducks and get their share, but to be consistent in getting flowage, reservoir, or big, open-water ducks, you've got to be proficient in a number of techniques, including "calling," decoy location, and concealment. We'll be discussing each subject in separate articles. Today we're going to talk about the proper use of duck calling. Duck calling requires proper "technique" and knowledge. No one should sit and aimlessly "babble" with calls, and expect ducks to come in. Ducks are used to hearing other ducks! So if you expect that ducks will come in if you do some squawking with any type of call, you're going to be sorely disappointed. Get a video/DVD/CD and watch it. There are companies and individuals who deal in these things, and you can watch and watch and watch again, and then do some practicing, until you get the hang of it. You can physically get out with someone who knows what they're doing, and who will teach you what to do. It takes more than one "lesson." Patience is needed. You're not going to become an expert caller after one outing. Phil Schweik's favorite is to simply listen to the ducks and imitate their sounds. That can take years to master. Best suggestion is to use the three methods in conjunction with other. It'll take time, but it'll be worth it. Schweik says the most common mistake is that hunters call too much. Once you make that first call the ducks know where you are, as they will surely hear you. Keep squawking and they're going to fly right by. Make one or two calls and then hunker down and wait. Ducks may fly by even up to a mile from where you are, and you start swearing to yourself about missing them – and then, voila - -suddenly they bank and come back. They may make two or three passes and then decide to land. If the ducks fly by and seem interested, but don't land, that's the time to make a subtle, quiet call -- like a feeding call or a "coaxing" call telling them to join their buddies (the decoys). What happens often, is that as the season progresses, the ducks become more and more cautious, and they will make numerous passes to determine whether it's safe to land. Once they feel safe, cup their wings, and get ready to land, they'll float right in, and that's the time you jump up and shout: "Take 'em!" Phil Schweik prefers shooting while the ducks are still in the air, as he deems this method "more sporting." Some hunters will fire when the ducks land. It must be said that no matter how hard you work, or how good you are, things don't always work out. Sometimes the ducks will simply not land, or will fly by with impunity. Just chalk it up to experience, and wait for the next group. Be happy to know that there's always a "next group."